WRIGHT-PATTERSON AIR FORCE BASE — Mary Lou Petersen is a volunteer popcorn pal who has perfected her popping prowess since 2010 in the main atrium at Wright-Patterson Air Force Base’s medical center. That aroma does more than fill empty stomachs. The donations people make for the tasty snack benefit the base’s Fisher/Nightingale Houses Inc. (FNHI), which assisted more than 1,100 current and retired service members and their families in 2014 and more than 20,000 in the last 25 years, providing an opportunity for military families to stay together for physical and emotional support while undergoing medical treatment. No taxpayer money has ever been used for the Fisher Houses’ expenses or support of the guests. The popcorn benefits FHNI from two perspectives, said Christopher Stanley, FNHI executive director. It creates much-needed awareness for the two houses, located on Sugar Maple Drive on base. “If someone comes to the medical center from out of town, and all of a sudden the patient is put into the ICU and they’re not expecting it, they may not even be aware of what a Fisher House is. We want the family to stay with us, not go off-base and pay for a hotel or sleep in their car or waiting room like what was happening before Fisher Houses existed,” he said. Secondly, the popcorn donations directly benefit the guests staying in the houses. “The income’s been great. It brings a fair amount of money to the mission each year,” Stanley added. In 2014, popcorn proceeds were about $17,500 after expenses. That’s enough to underwrite one month’s worth of FNHI operations at Wright-Patterson AFB. “Since we took it over, in almost 11 years it’s raised almost $145,000,” Stanley said. “That’s a lot of money from popcorn. “Trust me, as the guy who hauls three or four 50-pound bags of popcorn into the medical center every week as well as cases of oil and bags, napkins and paper towels, I know it’s a lot of popcorn,” he laughed. Volunteers are all-important to popcorn operations, Stanley pointed out. The two Fisher Houses on base are run by a small staff that doesn’t have time to devote to the fundraising effort. Currently there are three people who are popping for FHNI, contributing 900 hours of volunteer time annually. They cover three to four days per week. Petersen said volunteering as a popper is a stress reliever and source of major happiness. 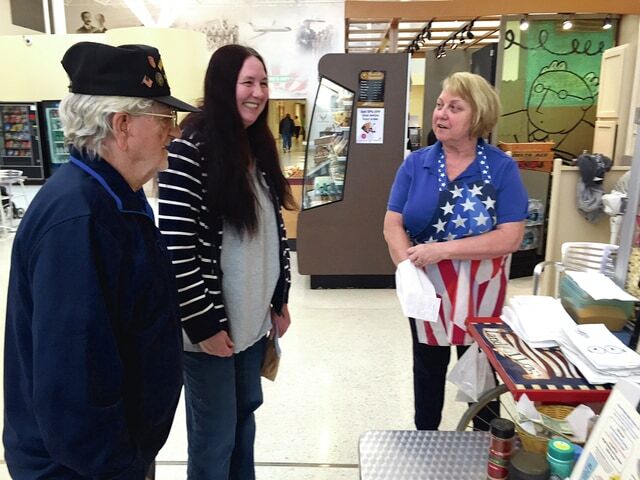 She’s also enthusiastic about watching active-duty service members greet veterans at the medical center, whom she often observes from her cart’s spot near the pharmacy. Petersen started decorating the paper bags to bring smiles to children. It worked with Jack – he easily recognized the Curious George face on his bag. Anyone who is interested in volunteering as a popper and who is 18 years old or older may contact Stanley at 937-672-8724. He said the training is quickly accomplished.